The town is made up of colorful small shops, restaurants, boutique, art galleries, yoga studios and the long standing Mana Foods Organic Supermarket which has been around since 1983. Shopping at Mana Foods is an experience in itself, it is the spot where the health conscious can find fresh organic foods at reasonable prices, they even have a deli, vitamin and beauty section. Another long standing landmark in Paia town is Charley’s Restaurant and Saloon, it has been around since 1969. Charley’s is not only a restaurant but also provides nightly entertainment. Many world famous musicians and stars have graced its stage and is also there favorite hangout spot, you never know who you might meet at Charley’s. Paia is famous for its Beach Parks. Baldwin Beach Park, Paia Bay also known as Baby Beach and Hookipa Beach Park. Hookipa Beach Park is host to a large number of annual international surfing competitions because of its natural setting and location it provides the unpredictable, exciting, yet somewhat dangerous challenge suitable for these events. Hookipa is for the experienced waterman/woman. Many Surfers, Kite Boarders and Windsurfers train and compete at Hookipa. It is also an amazing lookout spot because it is on a cliff and the beach is below, therefore, one can watch the surf action without getting there feet wet or sandy. One may not know this but Paia also has a private Golf Course called 9- Hole Maui Country Club and was established in 1927. As its name implies it has only 9 holes and no driving range. 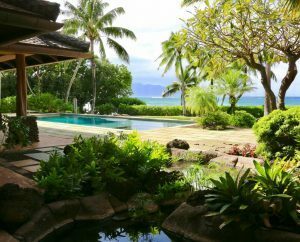 This course is located within the vicinity of Spreckelsville which is an affluent beach front neighborhood just minutes from Paia Town. One cannot talk about Paia town without mentioning 2 of its distinct population features. The “Surfers” and the “Hippies.” They all seem to flock to Paia… so please be thoughtful and give someone a ride.